British Filmmaker Bugsy Steel’s short narrative “Fighter” is a story about determination, strength, and overcoming obstacles. Ten minutes before a boxing match, a teenage boxer with downs syndrome fights for his right to get in the ring. After its Best Acting Ensemble nomination and Best Post Production win at the Lift-Off Season Awards, Special Mention at London-Lift-Off, and ahead of its screening at Manchester Lift-Off, we interviewed director Bugsy to hear a little more about how this film came to be, and his path as a filmmaker. Guy Bolton (the writer) and I wanted to make a film that not only showed a person with Down’s syndrome in a different role, but a role that was powerful, heroic and strong.There has been a lot of talk in the media about the inclusion of disability in film but rarely in a way that doesn’t show them as a victim and so I hope we have shown a different and more original angle to Down’s syndrome through our simple and small film. How did you first go about casting for the film? Were there any considerations you took when working with Tommy? Tommy is a trained actor through and through. He not only knew his lines but everyone else’s, he was prepared and ready at ever y step of the shoot and super professional. My approach to Down’s syndrome has completed changed since working withTommy and that’s why I feel that we definitely need more inclusion of Down’s syndrome in mainstream media. How did you balance the ambiguity of the film’s ending? Ambiguity was our main objective for this film and we knew that not only did we not want to choose sides, the film depended on us getting that across and right.This was harder than it sounded and we actually ended up having to cut bits out as they were weighing too much in one direction.The ending was always intended to rest on his choice and hopefully leave the audience thinking. I did shoot an alternative but as predicted it didn’t work but you can never tell so always worth having a back up. How did you develop the visual style? From the very beginning I felt this had to be hand-held, energetic, real and observational.The style had to keep you on your toes and be in your face, building the pressure with every scene.We shot single camera (Alexa) at a working men’s club in Peckham until the third day when we were lucky enough to have two cameras and one on a steadicam. This allowed me to get the rotating sparring scene which I had planned out and didn’t think we’d have the time to get but truly came to life in the edit. 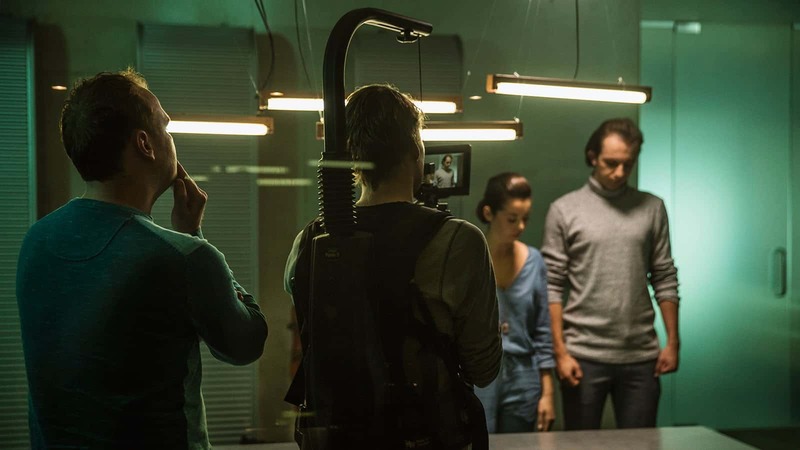 The DOP (Jann Doppert) wanted to light the rooms practically so that we could shoot quickly without having to constantly shift lights.This is a great move when you don’t have much time to shoot and in our case it helped a lot. The editing and cinematography is phenomenal – how did you go about bringing together that team? The style of the film wanted to feel intense and raw but also elevated and stylish, I don’t want to make a social drama I wanted to make Rocky meets Ken Loach. I therefore made sure that I worked with a team I knew and trusted. We talked about the look of the film early on and created a visual treatment to guide the style. Were there any unexpected or unforeseen challenges you faced on set? Yes a few days before the shoot, the location (Peckham Working Mans Club) double the location fee and made us use Location Collective, who in short charged us full price and refused to help in any way. This meant we had to take budget we didn’t have away from other aspects of the film to make the location work as we had no other options. Shooting a short film is harder than all the other film making platforms as you often have less money, you’re on your own and you don’t have the support of a client or bigger production to help with such events. What impact have you witnessed this film having on attitudes towards disability? A great effect both in my self and others. If Im honest I was nervous going into this project and that was through lack of exposure and ignorance. Once I started to talk and work with ‘Tommy’ my attitude completely changed. I’ve also had people tell me how great it was to see such a powerful role and something out of the ordinary. Are you looking forward to Fighter screening at the Manchester Lift-Off Film Festival? Without a doubt. I think the Lift-Off Network is growing, and such a smart set up. I watched amazing films at the London showcase. I’m honoured to be a part of it, once more. Fighter Short Film Trailer from BRS on Vimeo. “Fighter” will screen at Manchester Lift-Off Film Festival 2018 on Thursday 29th March as part of the Local Filmmakers Showcase.